Alibaba is benefiting from China’s shift towards a consumer economy. The e-commerce group’s earnings in the last three months of 2015 offer another insight into the world’s second-largest economy, as well. Both the company and the country need to find new ways to grow. Revenue surged 32 percent year-on-year to $5.3 billion in the quarter, beating expectations. Transactions on Alibaba’s online marketplaces grew 23 percent, the slowest expansion in more than three years. But the $175 billion company’s “take rate” – how much, as a share of transaction value, the company captures from advertising fees and commissions – increased to 3 percent at the end of 2015, compared to 2.7 percent in the same period in 2014. Advertisers and sellers are paying more to Alibaba even as volume growth declines. Jack Ma’s company is benefiting as Chinese consumers get richer. The PRC’s GDP expanded 6.9 percent in 2015, the slowest pace in 25 years. Growth in property investment, a major driver of the economy, dropped to an unimpressive 1 percent – a seven-year low. The country’s retail sales of consumer goods were up 10.7 percent, though. Add the continuing trend from bricks-and-mortar to online retailing, and that’s positive for Alibaba’s top-line growth story. As with China’s economy, however, Alibaba’s sheer size makes growth harder to come by. After years expanding at a breakneck pace, the e-commerce group commands some 80 percent of its market and is now making a push for rural shoppers. Ma and his colleagues are also seeking new sources of revenue in areas like food delivery and cloud computing. Revenue for the latter accounted for just 2 percent of the company’s total, but it more than doubled to $126 million in the three months to December. Shares of Alibaba have fallen more than 15 percent since the start of the year. Rivals like JD.com and Baidu have experienced worse slumps. Alibaba’s fortunes may increasingly decouple from China’s macro economy, but that gives investors an even more challenging task trying to look into the company’s future. Chinese e-commerce group Alibaba on Jan. 28 reported revenue of $5.33 billion for the three months ending Dec. 31, an increase of 32 percent from the same period in 2014. Adjusted earnings, after share-based expenses and a one-off disposal gain, increased 25 percent year-on-year to $2.53 billion. Total value of goods transacted on Alibaba’s shopping platforms in China, or gross merchandise value, was $149 billion, up 23 percent from the same period in 2014. Mobile transactions topped $101 billion, up 99 percent year-on-year. 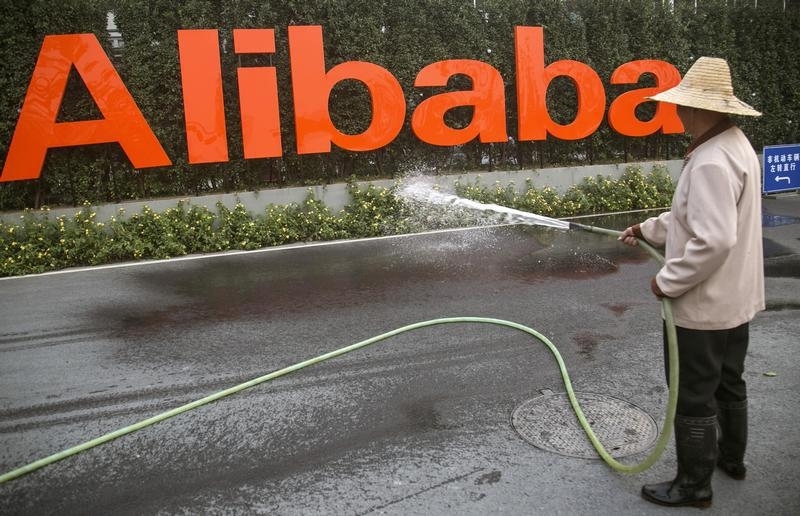 Alibaba’s U.S.-listed shares were up 4.6 percent at $72.72 in pre-market trading on Jan. 28.